The White Paper on HSR2 (11-3-10) has very little on which to comment concerning the plans northwards from Birmingham.The only definitive plan for HSR2 north of Birmingham is the connection from the Chiltern line to the WCML at Lichfield. From here everything is extremely vague with one line going to Manchester and the other to Leeds. However, the HSR2 Ltd. documents do have more suggestions so can be commented on. The line to Manchester ( "and on to Scotland") has, at this moment, neither a definitive nor even a provisional alignment from Lichfield. The probability is that a dedicated line would go through (or near) firstly Stafford then Crewe or Stoke-on-Trent and on to Manchester with a possible intermediate stop at M/C airport. If there is a stop at the airport then the better option would be to go through(or near Crewe). Building into the scheme the possibility of a stop at Crewe might be advisable for the sake of flexibility. The question of the line being extended to Scotland is accepted but not clarified. Will it run through Manchester and up through Bolton and Preston? Or will it diverge from the line at Crewe to go north through Warrington and Preston? If the latter is the case then the need certainly exists for building in a stop at Crewe. Whether the line goes directly through Manchester or from Crewe through Warrington then both routes imply massive works. In Manchester the only logical solution (for a high speed line) is to tunnel directly under the city. Even then there are tremendous problems to find a route through the outer boroughs of Greater Manchester and on to Preston - almost all the route would necessarily be new to Preston. Choosing the other alternative gives no insurmountable problems through Warrington and Wigan to Preston. The problem would be Crewe station itself. Since it is a junction with lines converging from all the points of the compass then the separation of some lines, particularly the WCML, from the others would be essential to ensure smooth running and avoidance of crossovers. The Manchester Station itself presents problems. If this is a terminus station, at Piccadilly, then the present platforms are not long enough to accomodate 400m trains. The solution presented mentions combining platforms to provide the length necessary with the construction of 4 new platforms in the car park north of the present station but adjacent to it. However, if the station were not a terminus but a through station then it could be constructed underground or on a different sight. This latter would mean greater destruction of property and the need for some tunnelling anyway. Whichever solution is chosen it means extensive construction. The Liverpool extension: The need to connect Liverpool with the high speed line was recognised but not the way to do it. Four possibilities have been mentioned all terminating at Liverpool Lime St..
1- Direct from Manchester which would most likely use the, then, recently electrified Chat Moss line through Earlestown-St.Helens Junct.-Huyton . 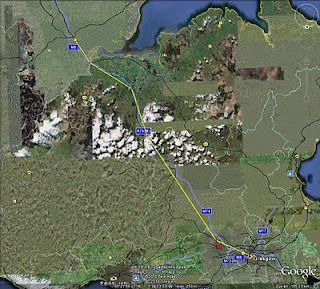 2- From Crewe through Warrington BQ - Earlestown -St-.Helens Junct. - Huyton. 3- From Crewe through Warrington BQ then connecting with a new chord to the CLC line to run through Widnes and L/P South Parkway. 4- The classic line from Crewe through Runcorn and L/P South Parkway (for the airport). Each option has its own difficulties. 1- Means somehow connecting M/C Piccadilly with the Chat Moss line either with major works (under) in the city or through the slow connecting lines through the city.The advantage of high speed is thus lost. Connecting to the CLC line at Piccadilly would be possible but entail the electrification of the line from Piccadilly through Warrington Central to L/P South Parkway. 2- This is an easy possibility except for the connecting cord at Earlestown where trains would have to slow to a snail´s pace to turn the corner. A new faster(i.e. wider) chord is not an option. Some advantages of high speed are lost. 4- The classic line from Crewe through Runcorn is by far the shorter distance of the four options and most probably the fastest. Upgrading the line to faster speeds and the wider width and height gauges plus platform lengthening would present substantial work though this would be no greater than on the other lines, probably less. The Liverpool station: Liverpool Lime Street station presents great problems as all the platforms are too short to accomodate 400m trains. The station neck itself precludes platform extension,or major works to widen it, while neither are works possible at the main entrance end. What has not been mentioned (nor apparently thought about) is the increased traffic into an already overcrowded station with the electrification of the Chat Moss line to Manchester(Transpennine trains) and the Huyton-St.Helens-Wigan infill (Liverpool-Glasgow/Edinb. services). Even without the HSR trains there will be difficulty in finding train paths and platform space for all the demands. The solution we offered was mentioned in a previous blog (Fast Trax 4 - 28/2/10) in point 15. This mentioned the possibility of reopening the old Liverpool Central (High Level) station to alleviate the pressures on Lime Street.The tunnel into the centre of the city still exists and is in partial use by Merseyrail. Since the original line was four-track there should be no difficulty separating the third rail DC services of Merseyrail from the overhead gantry electrified AC services of Network Rail. Some work would be necessary as we point out in that blog but options 3 and 4 of our previous point are both possible - without excluding the possibility of a new line option(as we have also previously mentioned in Fast Trax 3 - point 2 paragraph 2 - 28/02/10) under the Mersey from Chester. The Leeds extension: The HSR2 line divides in the Midlands - exactly where we do not know - to continue to East Midlands (airport) Parkway. From there it continues through or near Nottingham up to Sheffield and Leeds. To fudge the issue and not make committment to enter into any city HSR2 Ltd. just mentions an East Midlands and a South Yorkshire Interchange before Leeds. We welcome the idea of a HS line from East Midlands Parkway to Leeds as we stated in a previous blog (Fast Trax 3 - point 5 - 28/02/10) but this would only form part of the MML from St.Pancras to Leeds. The section connecting the East Midlands Parkway to Birmingham we envisage as part of the Cross Country route on to Bristol as we stated in Fast Trax 4 - point 14(28/02/10). We said then and still hold the position that this route will not be built in the foreseeable future if ever. The principal reasons for this are that the options for the MML and ECML to be upgraded to high speeds make for a more realistic approach as we stated in Fast Trax 3 - points 4-6 (28/02/10). It is relatively easy to upgrade the whole of the ECML to high speed from London to Newcastle if it is ensured that it is four-tracked in its whole length. From Newcastle to Edinburgh a new line is a better solution as mentioned below. The MML, on the other hand offers greater possibilities. If this line were upgraded to the East Midlands Parkway the cost would not be prohibitive. However, if a new line were built from EM Parkway to Leeds there would be a serious alternative to the ECML also providing additional capacity. The other more radical idea we proposed was for the line to divide at EM Parkway with a new line being constructed from there to Derby and then Stoke, then connecting to the WCML to Manchester. This would subtract traffic demand from the WCML to Stoke. We still consider this a better, cheaper and more effective solution. And on to Scotland: It never was our intention to consider the high speed line extensions to Glasgow and Edinburgh last. However, since the importance, in detail, is much less in the White Paper than the connections to the North West and Yorkshire, then that is the way the blog has turned out. It does not mean our opinion about the importance of the connections to Glasgow and Edinburgh is diminished, quite the contrary. Part of the reasons given for a high speed line to Scotland is to reduce the road and air traffic, and thus noise and pollution, while obtaining a reduction in the use of already overcrowded trunk roads/ motorways, thus reducing the need to construct new ones.Therefore, cannot we construct (or upgrade at the very least) where it is easiest? There is a tendancy to look at all problems to be solved as starting from London. This means we always look at the problems from south to north, from bottom to top. That is not wrong but we can get a better perspective if we turn the map round with Glasgow and Edinburgh at the bottom while London is at the top. 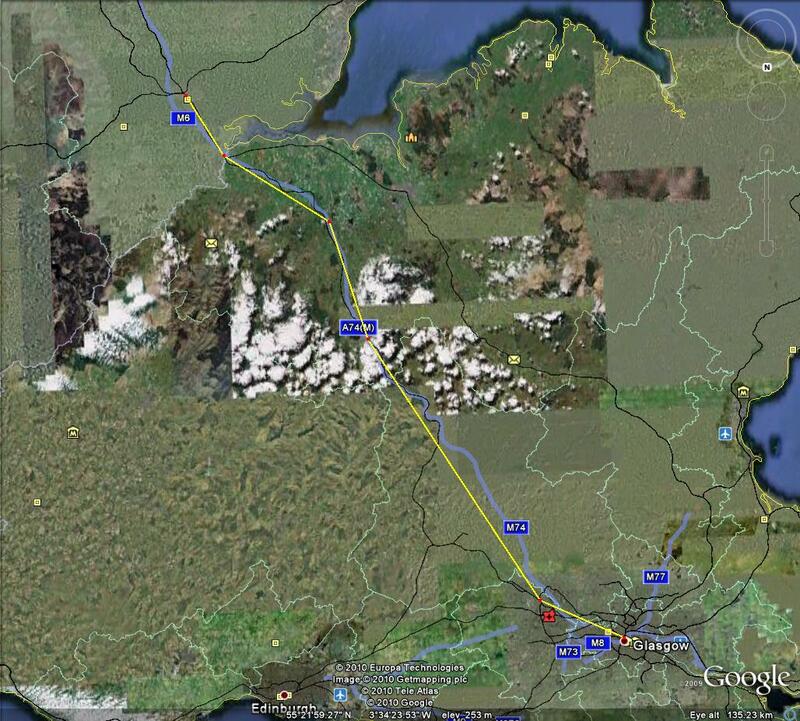 If we go upwards from Glasgow we see that there is no city of note before Carlisle. If we go upwards from Edinburgh then the same is true until Newcastle. We consider, then that a new line could be constructed across the Lowlands more directly to Newcastle. This would follow the corridor of the A68 road to Galashiels, continue to Kelso, round the northern part of the Northumberland National Park to Wooler, then down through Morpeth and Newcastle airport and into Newcastle itself. This would complement the present ECML line from Edinb. -Dunbar-Berwick-Newc. The Edinb-Newc. line could have stops(for regional traffic) at the places mentioned thus providing passing points for the fast traffic over the slow. The line from Glasgow would follow the present WCML route through Motherwell - Moffat - Lockerbie - Gretna - Carlisle. By building a double straight rail line in the same corridor as the present WCML there would be sufficient capacity for both freight and passenger traffic (both long distance and regional). However, this might prove too much to ask initially. An upgrade of the present WCML line to ensure the maximum width and height gauges would probably be more realistic in the mid-term. New sections of line would only be constructed to supplement the worst "bendy bits" so they could then be used as passing points for fast traffic over slow traffic. The net result of these constructions would increase line speeds, increase the frequency and quality of the services provided(both long distance and regional), absorb the projected increase in traffic on the north south routes, very probably increase market share of all the north south traffic(road, rail and air), reduce atmospheric pollution, probably reduce traffic congestion and thus reduce the need for new roads, and draw the two countries closer together. The present 75min. journey from Glasgow to Carlisle could be reduced by up to 20mins. while the 90 min. journey from Edinburgh to Newcastle could be reduced by up to 40 mins.. This would then make the journey times from the two Scottish cities to the two English ones about 50-55 mins. - a substantial saving - at not such an exaggerated cost. From there the next stages could be tackled. The WCML needs work done from Carlisle to Lancaster - principally to be four-tracked - which would result in a new line in the same corridor but not so irregular. From Lancaster to Crewe and down the Trent Valley four-tracking is the essential work, with gauges, signalling and platform lenghthening but not so urgent if we have the alternatives. The alternatives are the MML about which we have already mentioned the basic ideas, and the ECML. The major problems on the ECML is from Newcastle to Darlington where a new straight line needs to be built to complement the existing main line thus making it a four-tracked corridor. From Darlington to York, Doncaster and Kings Cross the line is straight and so should be four-tracked all its length. The difficulty is at Welwyn where the line is a bottleneck and must be four-tracked (even for local and regional traffic). 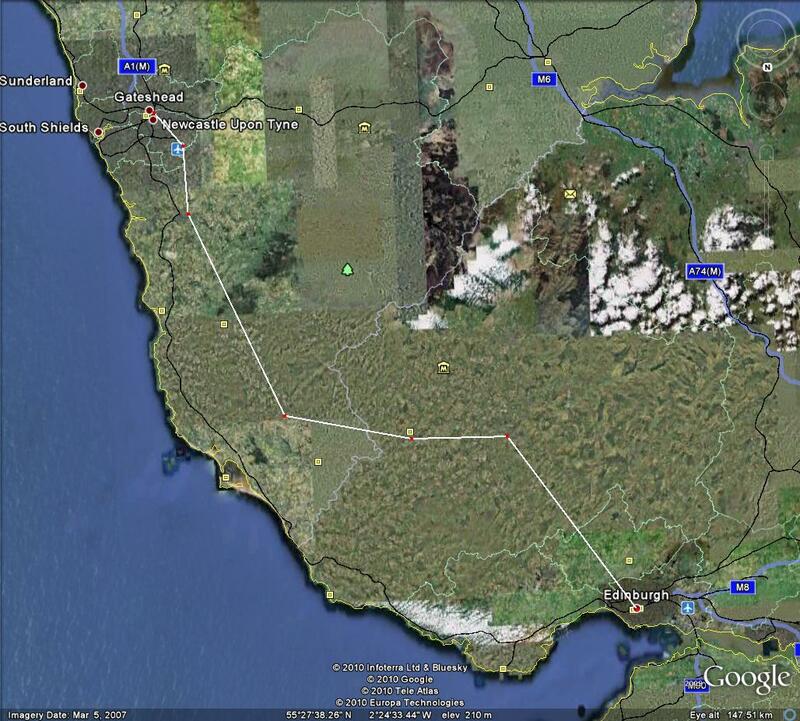 The construction of any new rail line has to be done realistically in stages. If a strategy is followed (and this White Paper is anything but a strategy document) then the pieces can be put together where needed and where feasible without slavishly following Treasury limitations. Though not the best of comparisons but still useful, the motorways were constructed that way. As long as you look at the compatibility of trains running on high speed and classic lines then the high speed network can get off the ground and make an impact on transport usage in the next two to three decades.